A parent theme for WordPress that has many adaptable hooks and filters to allow for an abundant of different addon’s and features. 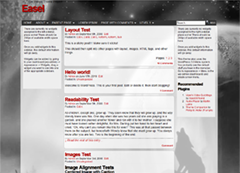 This theme has been designed from years of development of the ComicPress theme. Tech Support can be found in the forum. Customizable layout’s via layout-head and layout-foot files. Hooks and Features for advanced customization and creation of Addons. Built as a parent theme to allow even more customization via child theme. A generic empty style.css with default style for when a child theme is not present. Associated plugins that hook into the theme for yet, even more functionality. * Some plugins and addons are not currently available to the general public. Do Gooder Press - Three cheers for Frumph! To Było Tak » Tiny Victory- Now Including Featured Stories! I appoligize if this is the wrong place to ask this. I love the EASEL Theme you created that I’m using on my new site. I’ve edited a few font colors, but was interested to know if it’s possible to widen the body section between the two left & right columns. I see where I can widen the page, but it just adds to the right side of the right collumn. I’m using the Buddypress & forums & would love to have a wider area in between the outside columns for the threads in the comments. I’d also be interested in being able to lighten the background in the body section if it’s possible. I appreciate in advance any information you take the time to provide to me. I’m certain that you have a great deal more than I do to deal with. I can’t find the theme in wordpress.org. If you follow the link, it redirects you to the themes home. And if you search for “easel”, the onlly result is the Comic Press theme. It is getting an overhaul right now; if you’re using Comic Easel, use the new ComicPress 4. * theme instead. Will you be launching easel theme again or are you scrapping it?